Anteater is the common name for truly toothless mammals of South and Central America that are highly specialized for feeding on ants and termites from their nest hills. 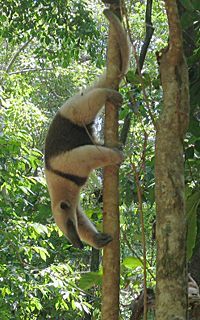 The term technically is restricted to four living species of the suborder Vermilingua, namely the pygmy or silky anteater (Cyclopes didactylus) of family Cyclopedidae, the giant anteater (Myrmecophaga tridactyla), and lesser anteaters (Tamandua tetradactyla and T. mexicana) of family Myrmecophagidae. According to the mammalian classification of McKenna and Bell (1997), sloths and the suborder Vermilingua together comprise the order Pilosa, which in turn comes under the superorder Xenarthra (Edenta) with the armadillos. Though these so called anteaters and the true anteaters belong to unrelated groups of mammals from widely separated geographical regions (spiny anteaters and banded anteater from Australia, cape anteater from Africa, scaly anteater from Asia, and true anteaters from South and Central America), all of them have undergone similar morphological as well as behavioral adaptation for the common habit of feeding on ants and termites. This is the evidence of the fact that utilization of the same niche anywhere takes place by similar animals with homologous or analogous organs. In another words, the body of animals are purposefully designed according to their habit and habitat or their purpose, no matter where they come from or what they are. Reflecting the harmony in nature, anteaters feed only a short time and lightly at any one termite or ant nest and then move on, allowing the insects to replenish their colonies rapidly. Anteaters, in turn, are a prey species for large cats (puma, jaguar). 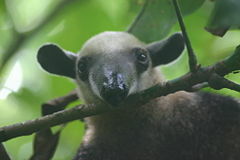 All of the four species of true anteaters are characterized by a long tubular and tapered snout with a small terminal mouth/nose; an extraordinarily long worm–shaped tongue (about 2 feet long in case of giant anteater); and a lack of teeth in the snout. The forelimbs are remarkable; their paws have very sharp, long, and backwardly hooked claws, with the third claw being especially well developed. The external ears are small and rounded, and the eyes are small. They have a small round brain. Anteaters have generally poor hearing and eyesight, but a very good sense of smell. In fact, the sense of smell in the giant anteater is regarded to be some 40 times stronger than that of humans (Online Anteater 2001). The largest extant representative of the group is the giant anteater, an animal measuring 4 feet (1.2 meters) in length, excluding the tail, and 2 feet (60 centimeters) in height at the shoulder, and weighing over 30 kg. It has a long, thin head and a large, bushy tail of about 2 feet (60 cm) long. The giant anteater's prevailing color is gray, with a broad black band, bordered with white, starting on the chest, and passing obliquely over the shoulder, diminishing gradually in breadth as it approaches the loins, where it ends in a point. Giant anteaters are sometimes mistaken for bears because of their claws and bushy fur. The giant anteater's species name, tridactyla, comes from "tri" and "dactylos," which are Greek words for "three fingers". However, the giant anteaters actually have five toes on each paw (the fifth is vestigial). The name probably came about because only three of the front toes have prominent claws and can be easily seen. The giant anteater walks clumsily on the soles of its back feet and on the in–turned claws of its front feet. The two anteaters of the genus Tamandua, the southern tamandua (T. tetradactyla) and the northern tamandua (T. mexicana), are much smaller than the giant anteater, only about 3 feet (90 cm) long. The usual color is yellowish white, with a broad black lateral band, covering nearly the whole of the side of the body. Each anteater has short hair. The silky anteater is only about 14 inches (35 cm) long, nearly about the size of a rat. It is of a general yellowish color. Its silky golden fur makes it resemble the seed pods of the silk cotton tree. Both the tamanduas and the silky anteater possess partially prehensile tails for helping them in their arboreal life. Thus, the undersides of their tails lack hair. All four species of anteaters are found exclusively in South and Central America. The giant anteater frequents low swampy savannas, along the banks of rivers, and the depths of the humid forests, but is not abundant anywhere. It lives above ground, not burrowing underground like armadillos or aardvarks or up trees like other anteaters. The species is nocturnal when living near humans, but away from population centers it is active during the day. The giant anteater has no fixed home. Each night, a giant anteater finds a secluded spot and curls up to sleep, with its long bushy tail covering its head and body. The lesser anteaters differ essentially from giant anteaters in their habits, being mainly arboreal and nocturnal. They inhabit the dense primeval forests. The silky anteater is a native of the hottest area in tall humid forests, and is exclusively arboreal and nocturnal in its habits. Adult anteaters are normally solitary. Though they are generally not aggressive animals, when attacked they can defend themselves with the emission a shrill call (as in silky anteater) or with their saber–like anterior claws (as in giant anteater). An embrace by the giant anteater's powerful forelimbs can sometimes prove fatal. Anteaters feed almost exclusively on ants and termites, although they also take some beetle larvae and bees, and in captivity the giant anteaters accept some fruits (Myers 2001). Their sense of smell rather than any other is used to find prey (McDonald 1997). The anteater rips open a termite or ant hill with its clawed hand and works its tubular snout into the opening, sticking its long, worm–shaped tongue down into the heart of the colony. As the insects swarm to the damaged part of their dwelling, it draws them into its mouth by means of its flexible, rapidly moving tongue covered with sticky saliva. A full–grown giant anteater eats upwards of 30,000 ants and termites a day (CMN 2007). Anteaters seldom spend more than a couple of minutes feeding at any one nest. Only a few thousand insects are removed at one feeding and then the nest is abandoned. 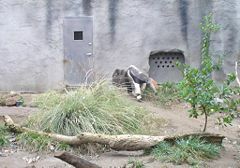 The anteaters circulate around their territories, feeding lightly here and there, never destroying any one nest and, therefore, never eliminating any of their food bases. Termites and ants recover losses very rapidly (Irvine 2007). Anteaters are usually non-gregarious animals and come together primarily for the purpose of breeding. Usually males are larger than females; however, in silky anteaters they are of the same size. The female produces one offspring per birth after a gestation period of around 190 days (for giant anteaters). During much of its first year of life, a young anteater will ride on its mother's back (or tail in the case of the silky anteater), though the baby anteater is capable of a slow gallop four weeks after birth (McDonald 1997). Giant anteaters rarely make sounds. They do it mostly when they are young; the sound is a high-pitched, shrilly grunt noise. A baby that has fallen off his mother's back will grunt to its mother either to remind her that it has fallen off or to simply instruct her where it is or to get her attention (Online Anteater 2001). The Myrmecophagidae family is known only back to the Early Miocene (25 million years ago) in South America, because of the poor fossil records; however, the group is likely to be older (Myers 2001). Anteaters' principal predators are the puma and the jaguar. Though the giant anteaters, like the other anteaters, are docile and inoffensive by nature, there large predators nonetheless must be careful in their attacks as a strike by the giant anteater's powerful forelimbs can sometimes prove fatal. The natural prey–predator relationship helps the animals to keep the natural equilibrium. Furthermore, the method of hunting of ant and termite hills by the anteaters is not at all destructive to the natural balance of the concerned species. However, in some areas, giant anteaters are becoming quite rare due to the trade in exotic pets, and the destruction of their habitats, as well as being hunted for their meat and for trophies—thus primarily due to human activities. Giant anteaters also are killed because they are mistakenly believed to kill dogs and cattle, and, perhaps most frequently, because they are easy to kill (CMN 2007). The lesser anteaters are hunted for the tendons in their tails, which make good ropes; they are also used by natives to rid houses of ants. Canadian Museum of Nature (CMN). 2007. Giant anteater. Canadian Museum of Nature. Retrieved October 29, 2007. Irvine, T. 2007. Anteaters. Vibrationdata. Retrieved October 29, 2007. McDonald, A. 1997. Anteaters. Andrew McDonald. Retrieved October 29, 2007. Myers, P. 2001. Myrmecophagidae (On-line), Animal Diversity Web. Retrieved October 29, 2007. Online Anteater. 2001. Giant anteater information, picture, links and more. Online Anteater. Retrieved October 29, 2007.